When I was in Vasco de Gama territory, I became a culinary explorer and threw dietary caution to the wind. Like 10 Things I Ate in Morocco, they weren't all healthy or sustainable, but at least they were local. I wanted to leave all my issues behind, but that's like the pope trying to be an atheist when he leaves the Vatican. Not that I'm comparing myself to the pope. Nope. I can out-eat him any day. 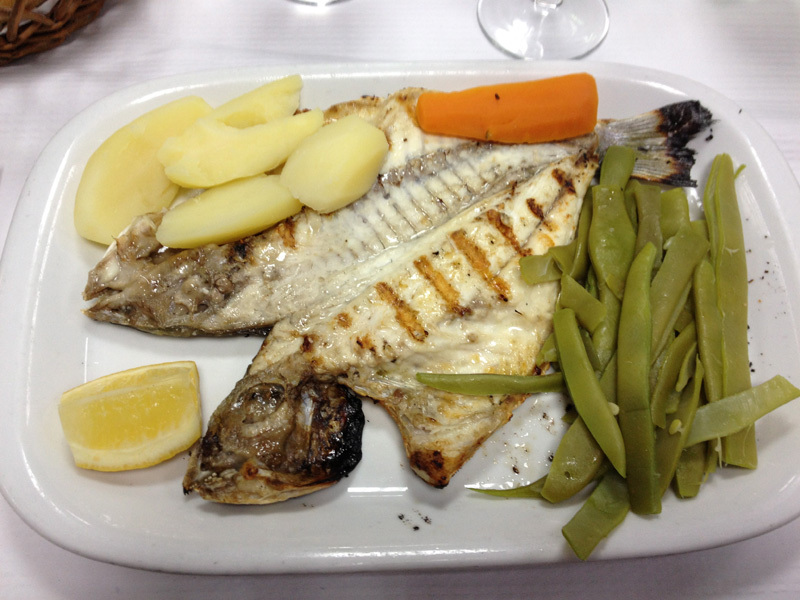 My first meal in Portugal was this grilled dourada in a charming, neighborhood Lisbon restaurant. The fresh, simple ingredients among a backdrop of mellifluous Portuguese chatter made for a truly memorable dining experience and was a portent of Portuguese cuisine to come. 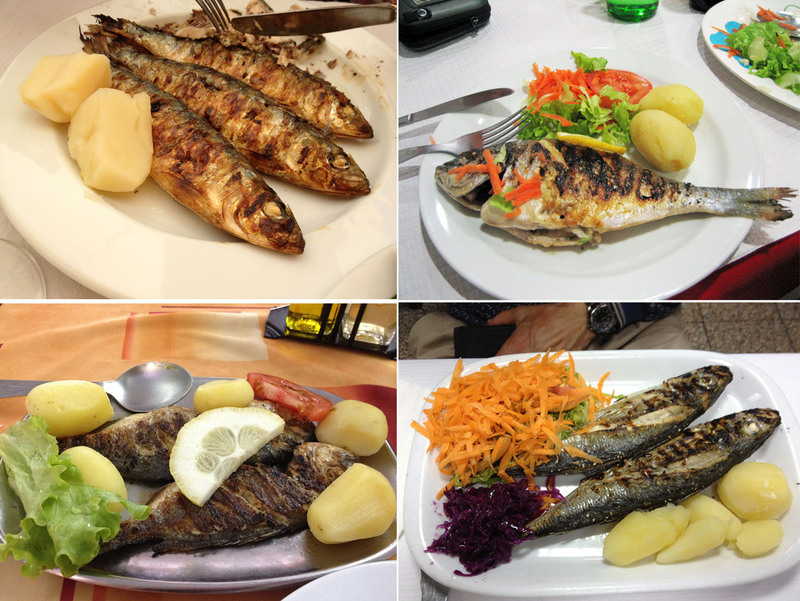 Sharing the same coast as Morocco, sardines also reign supreme here, but grilled dourada—aka gilt-head bream—had a starring role on the menus of the day. I felt a little gilt-y not knowing if it was sustainable. But I knew it sustained me. Until dessert. Hey, side-dish czar of Portugal: How did you decide that boiled potatoes would be the national accompaniment for grilled fish? Not that I'm complaining. Just questioning fish authority. 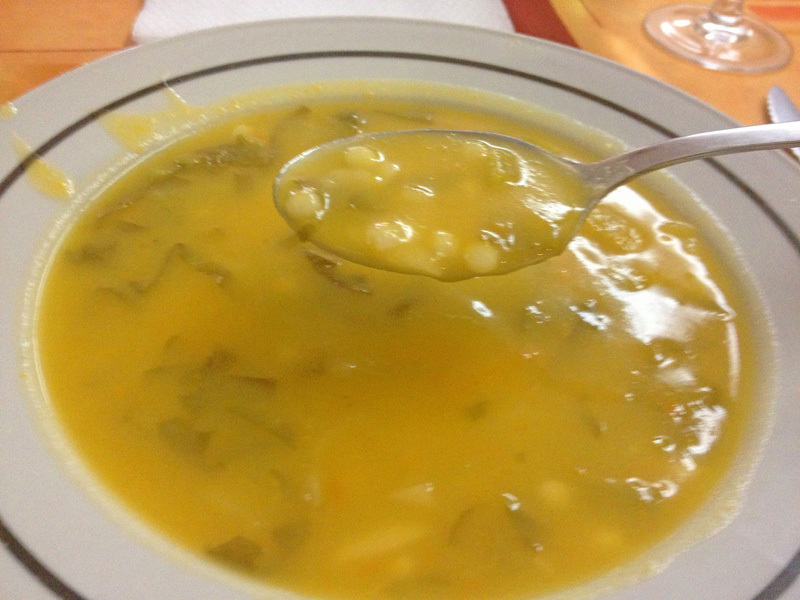 This delicate yet hearty vegetable soup was served with almost every meal I ate except breakfast. But if it had been, I wouldn't have complained. 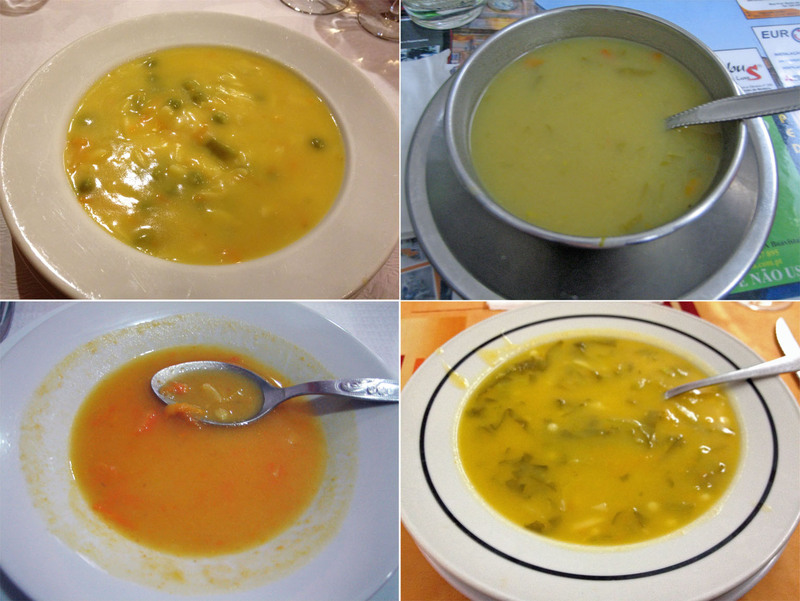 Much like Morocco’s harira soup, this really bowled me over in a simple, soul-satisfying way. While it was slightly different each time, I’m surmising it was some combination of puréed potatoes, carrots, onions, leeks, cabbage and kale. Don’t let those motley colors fool you. Although it was alphabet-free, I swear it was the same effing soup, give or take a few effs. 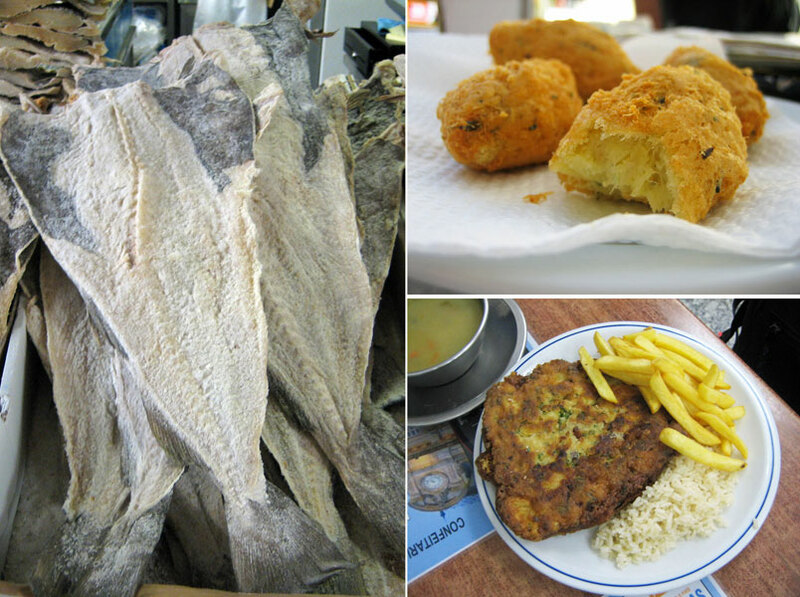 Bacalhau is dried, salted cod that’s a mainstay of Portuguese cuisine. It was introduced by sailors around the discovery of the New World before refrigeration, and there's said to be over 1000 recipes for it. Since Portugal is a huge seafaring country, it’s ironic that all of the bacalhau is imported from Norway, Iceland or Newfoundland. Every grocery store has a whole department devoted to this big, gray, dried-out salty specimen (bottom left). A contender for the fugly fish award, I could only bring myself to eat it camouflaged in the cod cakes and cutlets that populated every menu. 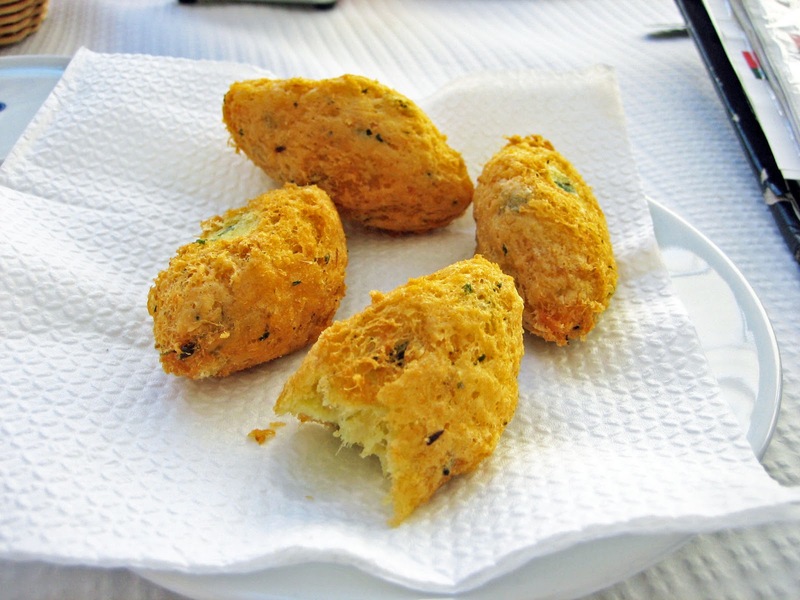 It may have taken balls to make bacalhau the national dish, but truth be told, it was very tasty, thanks to something called a deep fryer. 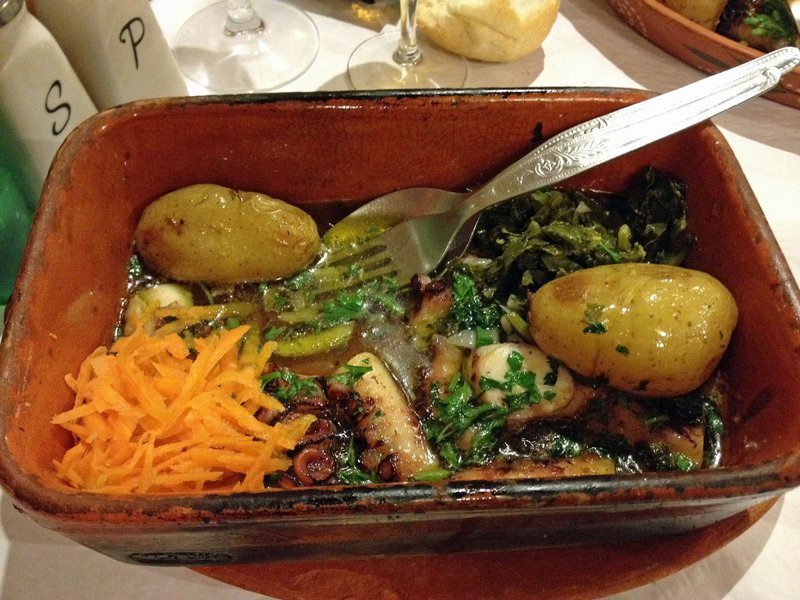 Just when I thought it was all about grilling and frying, a baked octopus went and threw me eight curves in a rustic little restaurant in the city of Porto. This terra cotta cookware was brimming with silky-soft octopus parts, potatoes, turnip greens and carrots in a delicate, locally grown olive oil broth—the key to its sublime flavor and succulence. The waiter had told me the baked octopus was their specialty, and sure enough, he wasn’t pulling my arms. 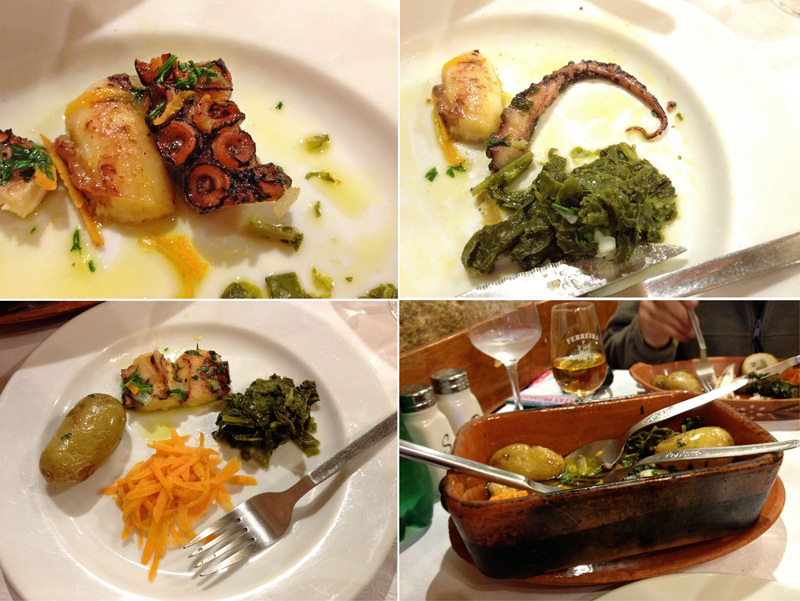 Octopus always kind of creeped me out until I had it swimming in fresh, fragrant, fruity Portuguese olive oil. Sheesh. To think my whole life could've been different. No, it’s not a big plate of pussycat. 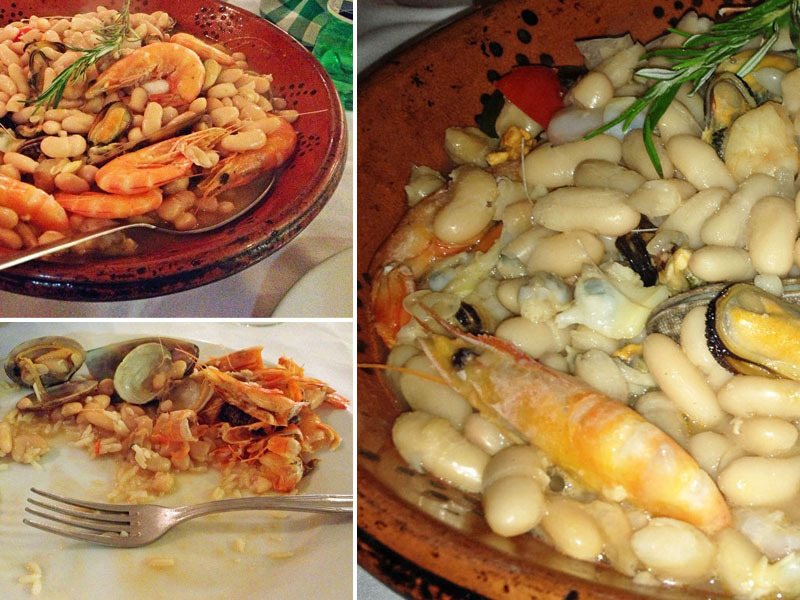 Cat-a-plana is a popular seafood dish from Portugal’s Algarve coast. 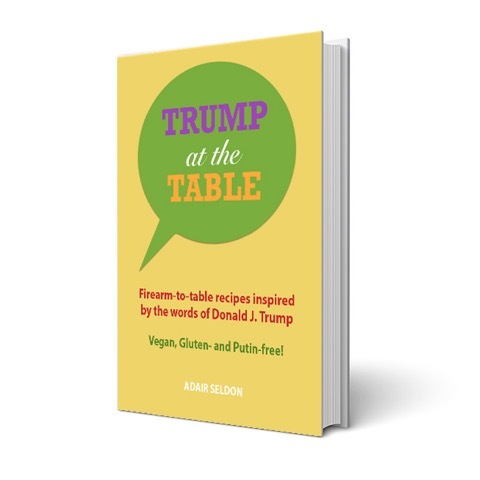 It’s also the name of the cookware used to prepare it, like a tagine is both the name of the cooking dish and the cooked dish. Traditionally a cataplana is made of copper and shaped like two clamshells hinged at one end and clamped on either side. 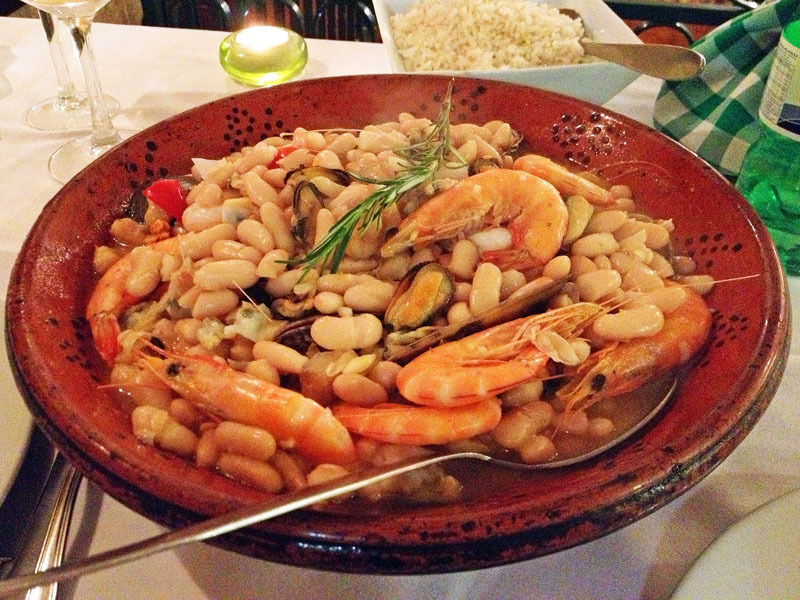 This heaping platter of 'plana was chock-full of shrimp, clams, mussels, white beans and served over rice. The beans aren't a traditional ingredient, but I guess the chef knew I was a rebel. It was earthy, oceany, heavenly, and humongous. Afterwards, the ocean called. It was out of crustaceans. 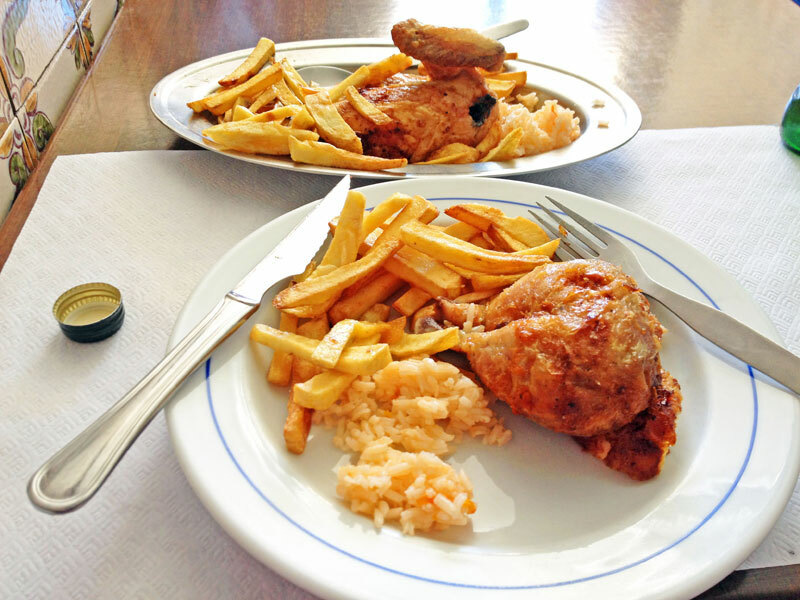 They love their crispy, succulent chicken in these parts, so as a practitioner of livin' la vida local, I pigged out on Portuguese poultry. 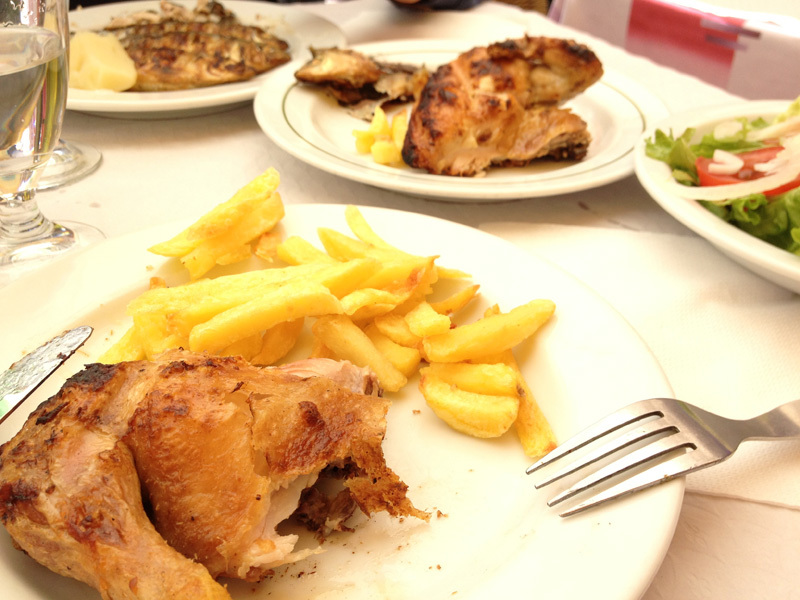 Apparently half a chicken is the new single serving, and when I had it in the seaside city of Cascais, I split it with my dining companion. 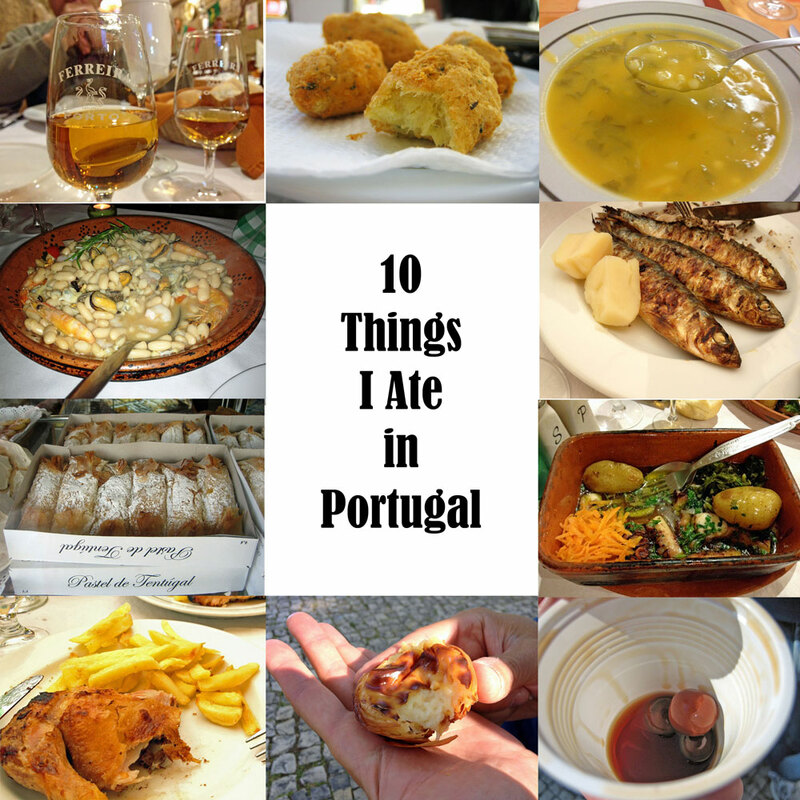 But when I ordered it again in Lisbon, I was flying solo, so I adhered to my conscious culinarian credo: never waste an animal and shared it with my imaginary friend. The waiter must've seen my imaginary friend since he brought the chicken out on a serving platter with an extra plate. But since my friend turned out to be vegan, I ate his too. Don't judge. I walked it off in search of a Pastéis de Nata. Pastéis de Nata are Portuguese custard tarts, customarily sprinkled with powdered sugar and cinnamon, that are in every bakery. They were introduced at the beginning of the 19th century by monks at a monastery in Lisbon’s area of Belém. It's said that convents and monasteries used a lot of egg whites to starch clothes and they used the leftover yolks for cakes and pastries, resulting in Portugal’s many confections. 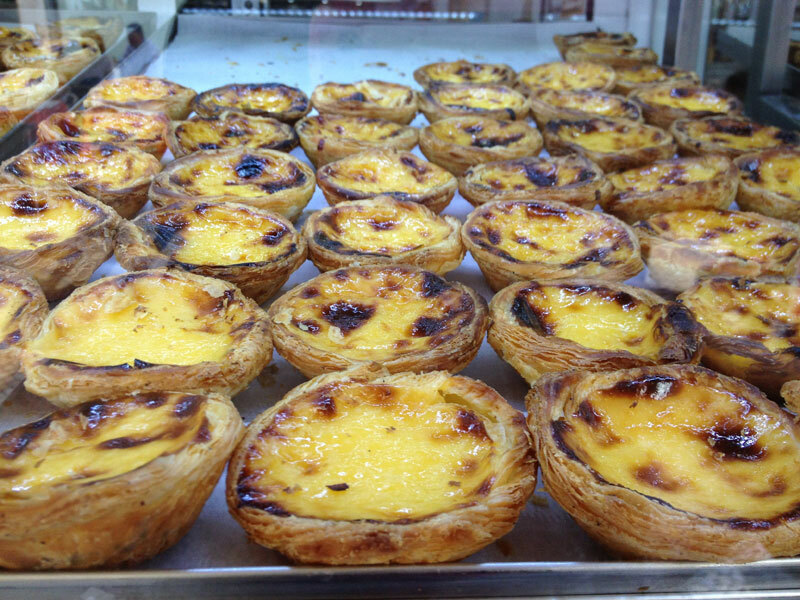 The original custard tarts, called 'Pastéis de Belém' (pastries of Belém), became a business next door to the monastery in 1837 that still exists today. The recipe is still a secret, known only by the master confectioners who handcraft the pastries in Belém. 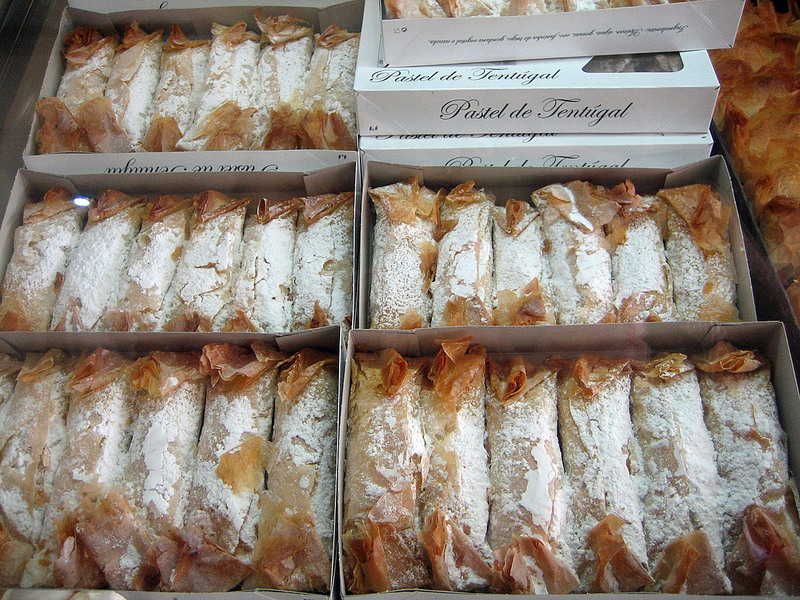 The original Pastéis de Belém shop was swarming with tourists, but I endured the hungry masses and got a six pack to go. I wolfed a few down that were still warm, but I thought the “mutt” varieties of Pastéis de Nata from other bakeries seemed just as tasty and less greasy at room temperature. 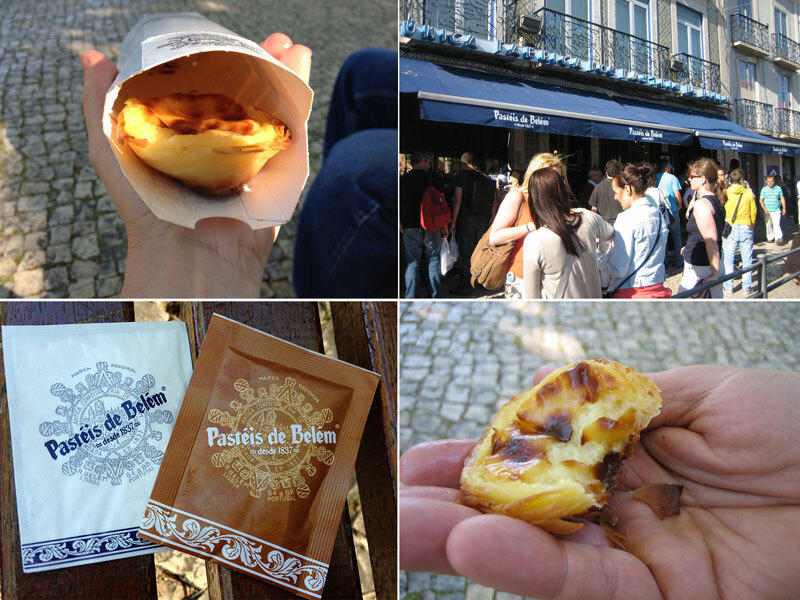 Take a virtual tour of the Pastéis de Belém shop. 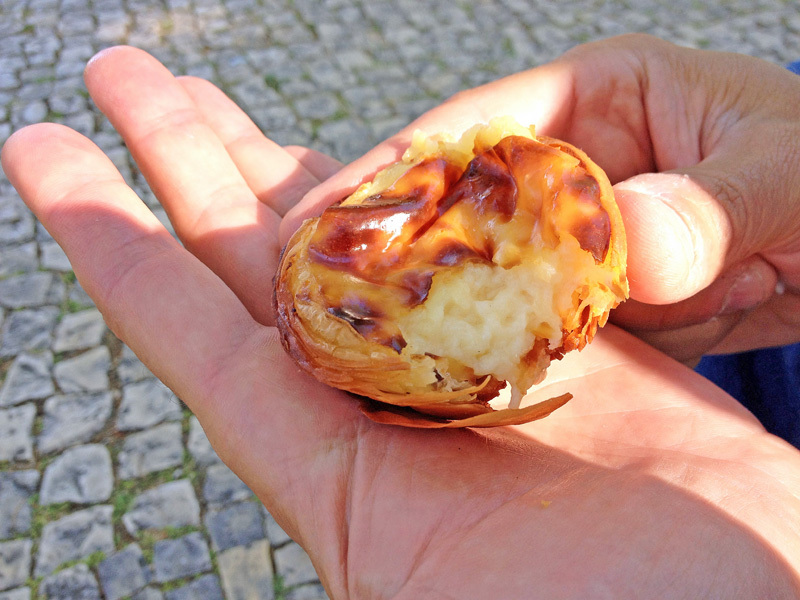 When I was in Coimbra (Portugal’s third largest city after Lisbon and Porto), I saw this curious pastry that came from the nearby town of Tentúgal. The recipe was conceived in a convent in the 16th century and its laborious preparation hasn’t changed in 500 years. Made from a dough similar to filo, the filling is a cooked egg yolk and sugar mixture known as doce de ovos. An eight-pound lump of dough made of flour and water is set in the middle of a white room with a white cotton-covered floor that looks like a germophobe asylum. The dough is stretched to 15 feet, becoming so sheer, you can see the crazy right through it. Watch the fascinating process. 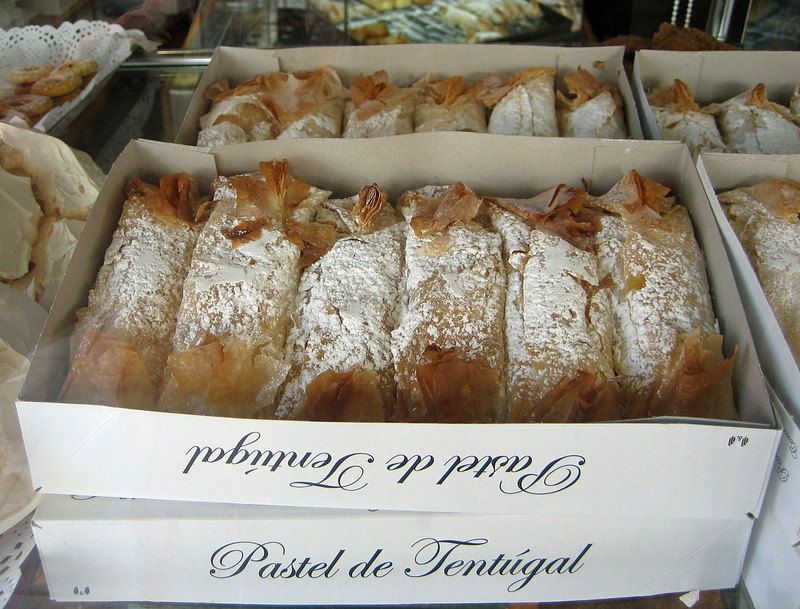 Apparently the church didn't count sugar as one of the deadly sins—unless you binged on a box of Pastel de Tentúgal. Read David Leite's sweet account of this pastry steeped in history and egg yolks. Technically, this is something I drank and not ate, but is there a law against counting the cherries? 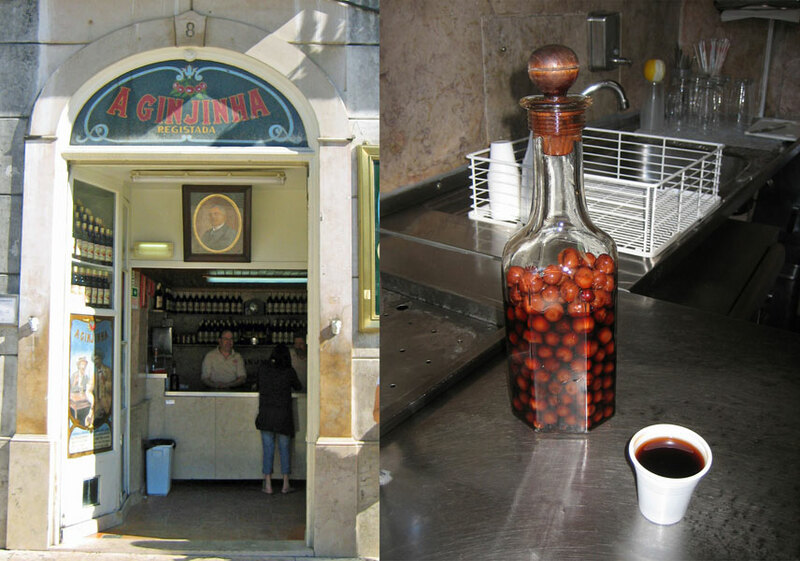 I sampled this traditional cherry liqueur in a celebrated Lisbon hole-in-the-wall ginjinha bar from 1840 that's still owned by the original, fifth-generation family. 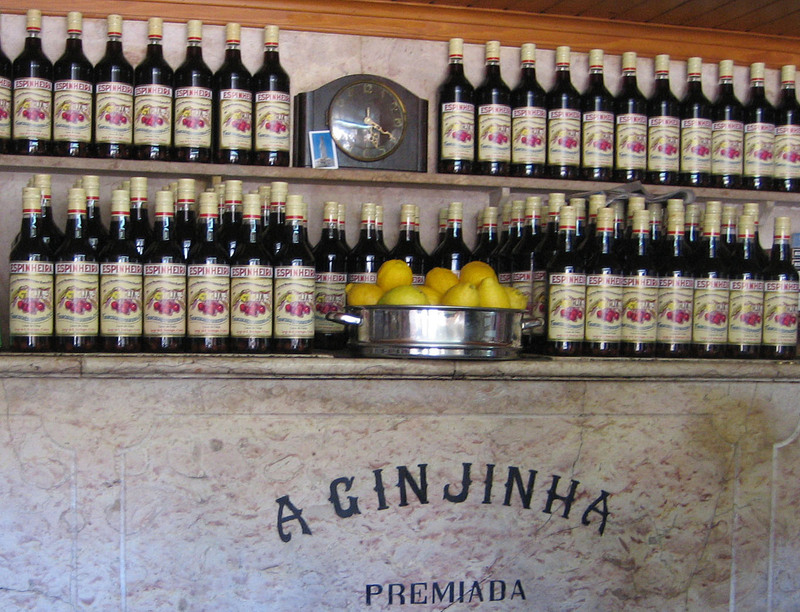 Invented by a friar in Spain, ginjinha is made from ginja berries (sour Morello cherries), aguardente (Portuguese brandy), sugar, water and cinnamon and is produced in the region of Estremadura just north of Lisbon. It may have tasted like an artisanal NyQuil, but by the time I got to the cherries, the medicine had kicked in and I was feeling no pain. They ask whether you want your ginjinha with or without the cherries. That's like asking if I want olives in my martini, to which I'd reply, "Hold the martini. 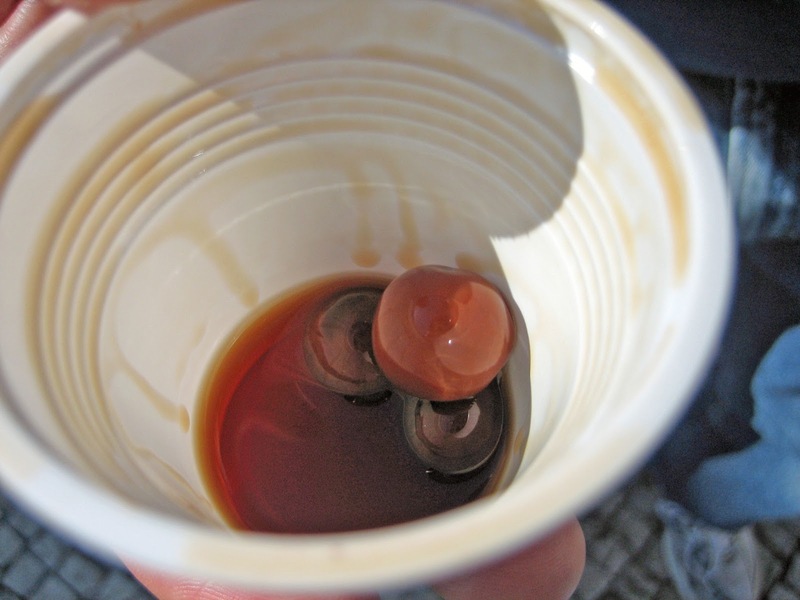 I'll have a glass of olives." See the bar in action. Again, technically this is something I drank, but last time I checked, grapes were a food. 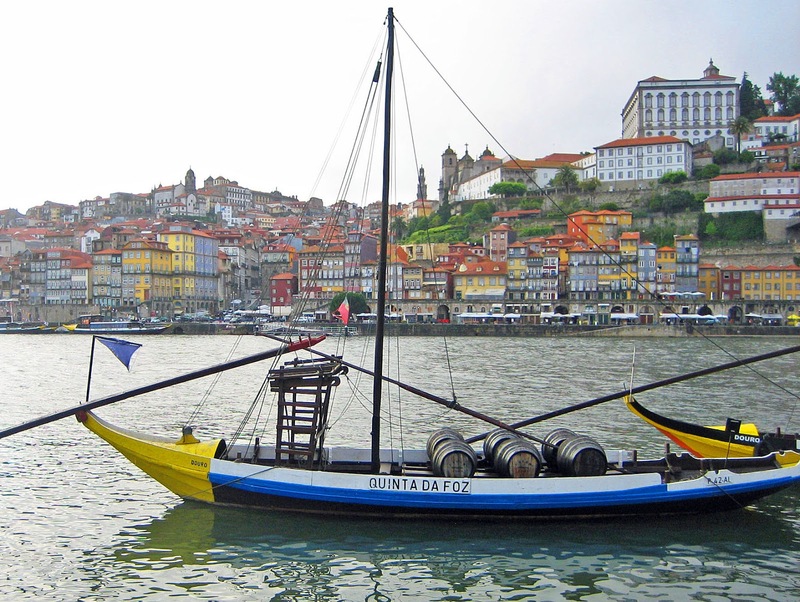 The city of Porto is famous for its Port wine, produced from grapes from the Douro River valley—the oldest protected wine region in the world. 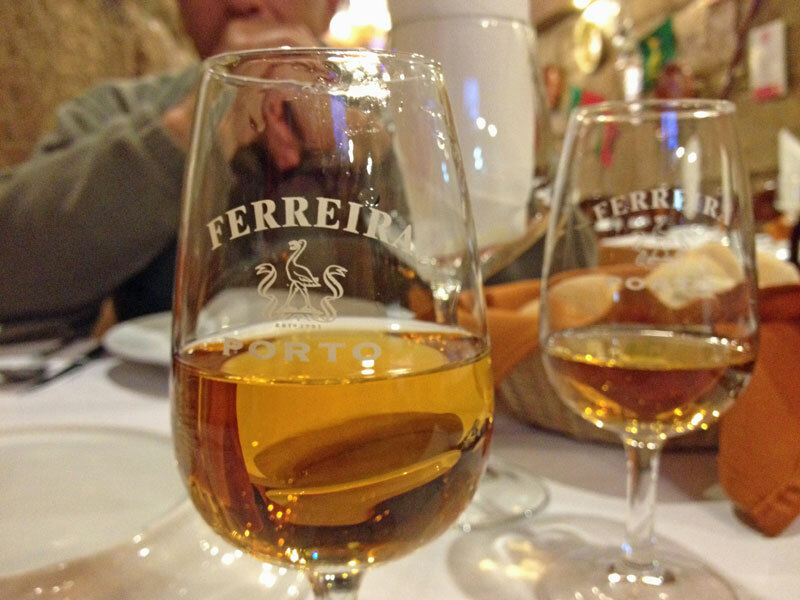 A fortified wine, Port is richer and sweeter with higher alcohol content due to the addition of a neutral grape spirit called aguardente (the same one used in ginjinha) to stop the fermentation. Served as both an apertif and dessert wine, the most common varieties are ruby, tawny and white. 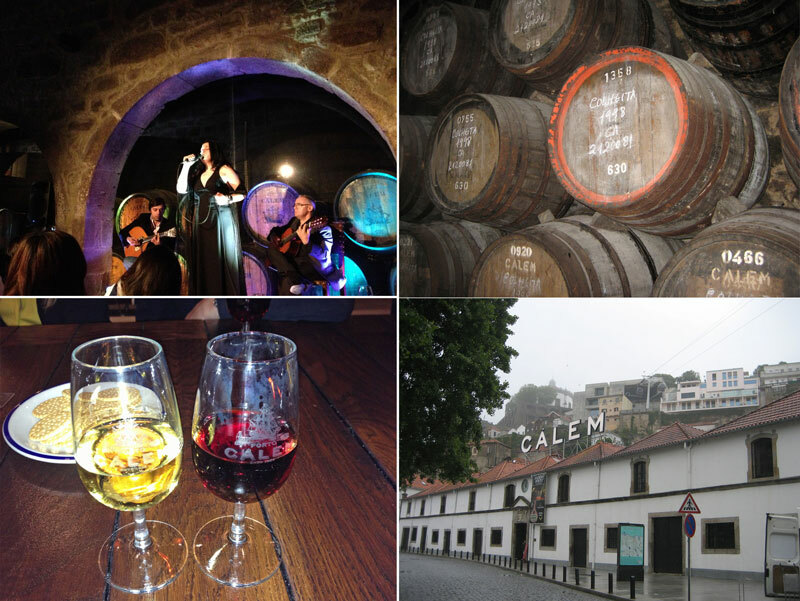 I crossed the Douro River to see the caves where the wine is aged and took a tasting tour of Calem that included an authentic fado music performance among the musty oak barrels and old stone arches. As I drank in the mournful notes of the fado bouncing off those majestic barrels of Port, I knew Porto was my kind of party. I could really go for that octopus dish. It looks so luscious. I love your travel posts, so many interesting photos.